Beijing has so far been able to avoid entanglement. 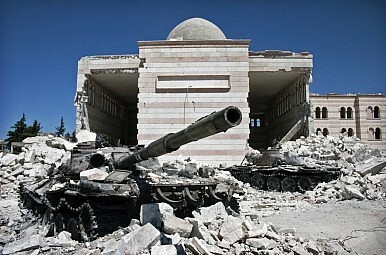 The Syrian civil war is an ongoing humanitarian and security nightmare that has entangled many regional and non-regional states. For countries like the United States, Russia, and to a lesser degree the major European powers, the crisis in the Levant has led to military operations in an effort to achieve some form of political or strategic stability. China, unlike other major powers, has thus far dodged the Syrian civil war and the costs of participation in that deadly conflict. Beijing’s avoidance has elicited the ire of several capitals, who level accusations of freeriding and willfully ignoring a humanitarian disaster. Yet Beijing is willing to incur some anger if it does not impede its objectives in the region. Within a very complex situation where states have had to consistently adjust to new variables, China is the unique actor that has been able to keep the instability of the Levant at arm’s length. The People’s Republic has only recently begun to position itself as a major actor within the Middle East and North Africa (MENA) region. Its years of economic success made the Middle East too important to ignore and MENA oil and natural gas are essential for maintaining the manufacturing and construction-dominated Chinese economy. Middle Eastern economies are some of the few remaining locales in which Chinese manufactured goods have not yet come to dominate the market. Even amidst an economic slowdown, the oil will continue to flow east and goods will continue to ship west. The One Belt, One Road initiative, a proposed web of infrastructure and trade connecting China to much of Asia, Africa, and Europe, prioritizes the MENA region as vital for China’s future. China may see economic opportunity within MENA, but it is also apprehensive about the region’s politics. Beijing observed the events of the Arab Spring with concern, particularly in how quickly regional stability eroded following revolutionary movements. China’s leadership has no interest in investing heavily in a state only to have that investment threatened by conflict. China needs the MENA region, but fears the direction the region may be turning. Thus, Beijing focuses on engagement with states seen as the most stable and will back whenever possible the forces that prop up the status quo. From the start of the Syrian civil war, Beijing has argued that stability is essential and political negotiation between competing parties is preferred. Until an environment arises where peace talks can make progress, Assad’s government is the legitimate authority in Syria for China. China has not contributed much by way of direct humanitarian relief, nor has it supported the military operations undertaken by a multitude of regional and non-regional powers to counter the Islamic State. What Beijing did do is increase its diplomatic outreach among the combatting parties in Syria and increase economic diplomacy with regional states. China’s national interests are not directly impacted by events in Syria and Beijing was willing to bet that any disappointment among regional states for China’s policy will not fundamentally threaten relations. Beijing has thus far been proven right. China’s policy is often critiqued, but it is not regularly increasing troop numbers as is Russia or trying to intensify the fight against ISIS as is the United States and its coalition. Instead, it is working to deepen economic relations with Saudi Arabia, Egypt, and Iran, among others. While Beijing opposed and vetoed United Nations resolutions meant to prosecute war abuses in Syria, moves rightfully interpreted as being pro-Assad, China’s leadership does not wish to be seen as an all-weather protector of Assad. That is a difficult task for Beijing, as it has long provided the Assad regime with military hardware and Chinese netizens are vocal in their support for Assad. China’s experiences in the region are mostly recent, but it does understand that taking sides within the political disputes of the Middle East inevitably leads to unforeseen costs down the road. This is the lesson Beijing took from the invasion of Iraq in 2003 and subsequent international military actions in the region, such as the Libyan campaign to assist the revolution in expelling the Qaddafi regime, have only cemented this opinion. China’s inaction on the question of Syria has allowed it to sidestep the conflict, but it has also cemented a perception that China is pro-Assad and created questions about China’s willingness to deal with issues outside of the economic arena. China’s approach to the MENA region has been called a means to freeride off the security provisions of other states. While Beijing would reject the notion of it being a free rider, it could not deny that China’s aims in the MENA region are facilitated by the security provisions of the United States and other Western powers. China has avoided becoming involved in the Syrian conflict, but its regional reputation has suffered as a result. With a deepening footprint in the MENA region all but guaranteed, Beijing will face greater expectation for it to become an active player in regional affairs. The Chinese will retain a preference of avoiding entanglement, but will find that increasingly difficult to achieve. Jeffrey Payne is the Manager of Academic Affairs at the Near East South Asia Center for Strategic Studies in Washington, D.C. The views expressed in this article are his alone and do not represent the official policy or position of the National Defense University, the Department of Defense, or the U.S. government.